The humble Brock consists of a length of string (from 3 to 10 ft) with a series of beads (from 3 to 5 beads) placed at various intervals. 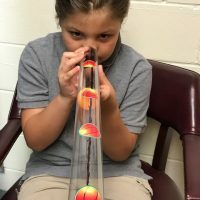 This simple instrument is powerful tools in teaching binocular vision skills. While the configurations vary, it is elegantly simple and effective in teaching the brain how to make the eyes convergence. The 3 ft string is generally sufficient unless working with an athlete then a longer string my be needed. Four or five beads make for enough targets to be useful. With the beads evenly spaced (closest bead at about 2cm, furthest about 40 cm), have the patient hold one end of brock string to their nose. The therapist holds the string tight and angled slightly downward. Have the patient fixate on one of the further beads to begin. The patient should see one bead (indicating focus to a single point) and two strings meeting at the front of the bead (indicating both eyes are working together. It should look like the picture below. Have the patient alternate from bead to bead, working closer and back to exercise the convergence muscles. Look for difficulty with maintaining the fixation as the muscle fatigue. Here is the video about the Brock String. The brock string takes advantage of “physiologic diplopia”. The eyes can only focus clearly on single point with all other things within the viewing area seen as double. This is a normal way for our eyes to work. The brock string uses this physiologic diplopia as a cue to the let brain know the eyes are working together correctly. Remember, before the brock string, check for full extra ocular movements and exercise the eyes separately. Brock strings are easy to make and make a great home program addition. 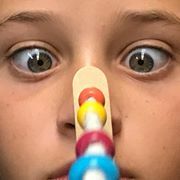 This entry was posted in convergence insufficiency, occupational therapy, vision rehabilitation and tagged brock string, convergence insufficiency, eye exercises, eye movements, occupational therapy, saccades, vision rehabilitation. Bookmark the permalink.